Pea Pebbles offer your landscaping a permanent and predictable covering. They work nicely in areas that require drainage, around flower gardens and walkways. They are great for weed control as well. They are both practical and decorative at the same time. However, there remains a chance that weeds will find their way to pop their ugly heads up among your pea pebble landscaping. There are ways to limit weeds from growing in your pea pebble areas. Before lying your pea pebbles be sure to put a layer of landscaping fabric down. 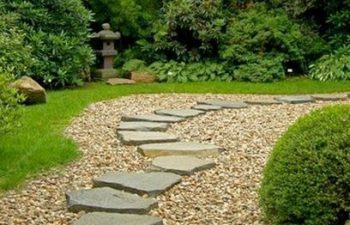 This will help discourage the growth of weeds and plants that may try to destroy the look of your beautiful landscaping. Pea pebbles are a great addition to your landscaping because they limit weed growth, however if they do pop up from time to time, there are ways you can naturally rid your area of them. Boiling water can kill your weeds among your pea pebbles. If you plan on not using that area of your landscaping for other growth, consider using salt to kill the weeds. Use this method sparingly because it will sterilize this area of your ground for years to come. Or, you can choose to remove the weeds the old-fashioned way by pulling them up by hand if there’s not too many of them. You can also use undiluted 20-percent acetic acid vinegar to spray over your area. This will cause your weeds to dry out. Contact Southern Landscape Supply for all of your sand and gravel needs. We offer pea pebbles and many more options that will accent your landscaping needs. Call us today to schedule your delivery anywhere in metro Atlanta.